Considers for approval by the Assembly, appointments under Article 179(2) of the constitution. Examines the accounts, showing the appropriations of sum voted by the house to meet public expenditure. Inquires into any alleged breach by any member of the Assembly of the Code of Conduct into any conduct of any member of the Assembly within the precincts of the Assembly. 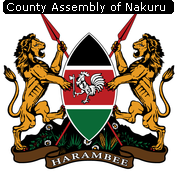 Scrutinizes the resolutions of the Assembly including committee reports, petitions and the undertakings given by the County Executive Committee. The main role of the committees is to oversight the county executive and ensuring that programs in each department are effectively implemented for better service delivery.